WEST PALM BEACH, Fla. - For the second day in a row, inclement weather interrupted play Thursday on the Minor League Golf Tour. Based on 12 holes, the fewest played by anyone in the 26-man field on the Estate course at PGA National, professionals Nick Latimer of Cleveland, OH and Patricio Salem of Lima, Peru, shared the top spot at four under par 42 with Naples amateur Ryan Celano. They received $552 apiece in cash or merchandise from the $3,046 purse. After a 3 hour weather delay, the golf course was deemed unplayable by the tournament committee and play was called for the day. MLGT policy is if everyone completes half the scheduled starting holes then it is an official tournament and the number of holes the final group completes will count for everyone. The final group in the regular division had finished 12 holes (par 46). 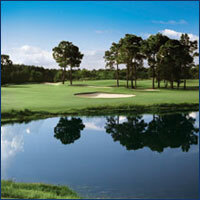 Qualifying School Contest #3 at the beautiful Seagate Country Club starts in just 4 days! It is a 36 hole event Monday and Tuesday May 21-22. The entry fee for the 2-day event is $350 with 40% of the field earning a check with an optional $200 Qualifying School Contest presented by Joey D Golf where the low score will win $4,500 (guaranteed) to put towards the Q-School entry of their choice. There are only 11 players signed up right now! First place in the contest will win $4,500 no matter how many players compete! Any questions please call Tournament Director Scott Turner at 561-598-9630. 50% of the field earns a check. Weather shortened to 12 holes. Par 46.